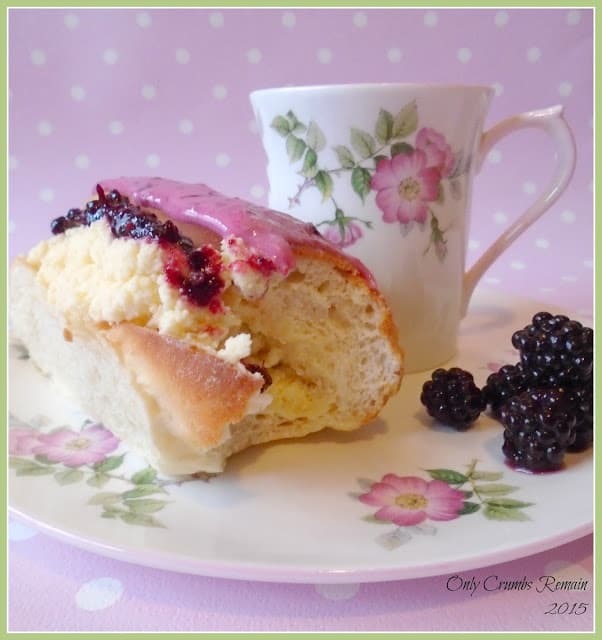 Iced fingers, two ways, inspired by the GBBO 2015 series. Firstly are blackberry and white chocolate fingers which takes full advantage of the plentiful supply of these wonderful berries. 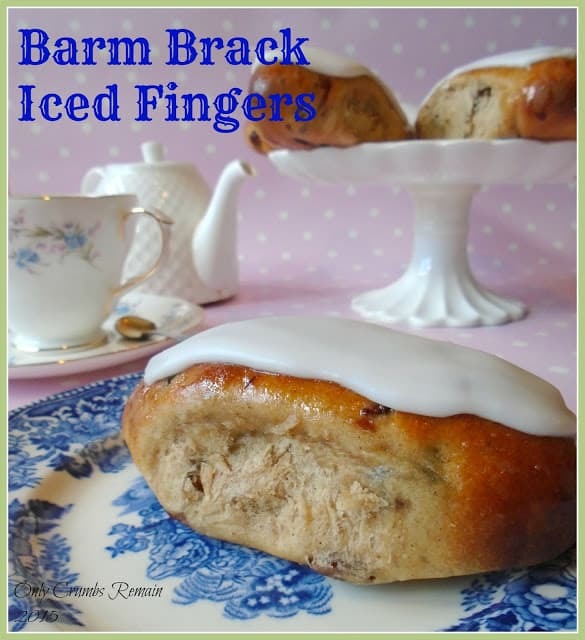 Secondly are Barm Brack iced fingers which are packed with dried fruit and a little spice. Three cheers to Nadiya, a Yorkshire lass, like yours truly, for being a deserving winner of GBBO 2015. I’ve thoroughly enjoyed baking along with the bake off, I’ve learnt new techniques and skills and remembered how much I love making pastry (until the other week, I’d not made puff pastry since I was a teen!) And, of course I’ve come across some great new blogs to read, which is no bad thing! The three GBBO finalists faced making filled iced fingers for the signature, millefeuille in the technical and a minimum of a three tier traditional British cake for the showstopper. Despite loving making pastry and because Mr E & I don’t need to be inundated with cake, we decided to attempt the filled iced fingers. Iced fingers are made from an enriched bread dough, which has the basic ingredients of milk, butter and sugar added to the flour, yeast and a little salt. It makes a gorgeous dough; it’s really lovely to work with being so smooth and silky once it’s been kneaded for a few minutes. Like the three remaining contestants I decided to make two flavours of iced fingers. Our favourite enriched dough, to press, is Barm Brack. It’s a traditional Irish bread originally made for Halloween with the inclusion of dried fruit and a little spice. The dried fruit was soaked in tea (I used Yorkshire Tea, of course) whilst the dough was prepared. After proving, the dough was shaped into fingers and allowed to rise for a second time before baking. The top of the fingers were glazed in a sugar solution and then topped with a plain water icing, after all with all the flavour in the bread it doesn’t need anything else bringing to the party. Also, for this reason, we decided to leave them unfilled; well up here in Yorkshire (and Lancashire from Mr E’s perspective) the iced fingers we enjoyed as children from bakeries were never filled. The second batch of iced fingers we made were blackberry and white chocolate. Raspberries are often teamed with white chocolate and given that we still had a box or two of foraged blackberries in the freezer we decided to see if they worked as well as raspberries with the white chocolate. They certainly did. A plain white enriched dough was made (using Paul Hollywood’s recipe though I used a little more flour as I found it a very wet dough – which is reflected in the recipe below) and once baked they were filled with a white chocolate ganache, which had been whipped to lighten it, and a homemade blackberry jam. The fingers were then glazed with a water icing flavoured (and coloured – no artificial colouring here!) with the blackberry jam. And the verdict? The difficulty was in deciding which to eat first! The barm brack was beautiful, as usual. 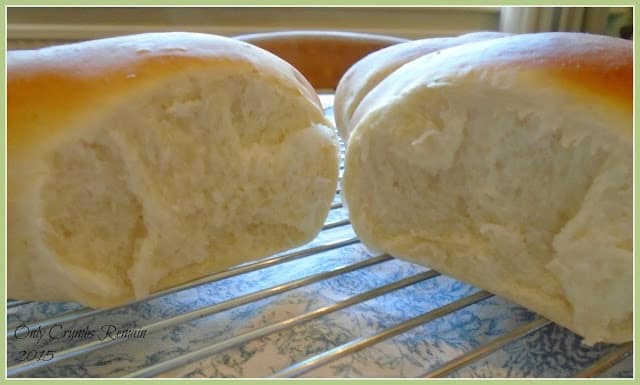 The dough is a little firmer than the white enriched dough so this meant that they didn’t expand as much in the bake thus creating less of a tear when separated. But they were still incredibly tasty and we’re glad we didn’t fill them. The blackberry and white chocolate ones were divine. The blackberry jam and blackberry icing cut through the richness of the cream filling beautifully. The blackberries provided a lovely clean flavour and wonderful colour to a simple bread finger. The bread was also beautifully soft and full of flavour. Quite a treat! Time: hands on time about 30 minutes; proving time; 14 – 15 minutes bake time; plus cooling time. Adapted from: The Barm Brack recipe from the Great British Book of Baking, accompanying GBBO series 1. 1. Soak the fruit: Place the raisins and sultanas in a bowl and pour over the tea. Set aside. 2. Make the dough. Place the flour, salt, cinnamon, mixed spice and diced butter into a good sized bowl. Rub the butter into the flour with your thumb and finger tips until it resembles breadcrumbs. Stir in the sugar and yeast. Make a well in the centre and add the egg. Pour in 3/4 of the milk. Using your hand, mix the flour with the liquid, adding more milk to bring the dough together and clean the bowl as you do so. You should need all of the milk. Place the dough onto a clean work surface and knead for 10 – 12 minutes, avoid adding any extra flour. The dough is quite a ‘close’ structure but will gradually become more elastic and stretchy as it is kneaded. Perform the ‘window pane’ test to ensure the dough has been kneaded sufficiently. 3. Add the fruit to the dough. Thoroughly strain the fruit, discarding the tea liquid. Flatten the dough out and tip on the mixed fruit. Bring the dough together and thoroughly distribute the fruit in the dough, kneading for a further minute. 4. Set aside to rise. Place the dough back in the bowl. Cover the bowl with cling film or a shower cap (purposefully used for baking) and set aside until it has doubled in size. This can take a little longer than a plain dough due to the added weight from the fruit. It will also depend on the temperature of the room, though ours took about 1.5 hours. Try not to rush this process, as the slower rise will develop more flavour. 5. Prepare a baking tray. Base line the baking tray with greaseproof paper. 6. Shape the dough. Tip the dough onto a lightly floured work surface and knock back. Divide into 6 equal pieces, ours weighed about 91g. Shape each piece into a ball and then roll into a sausage, all the approximate same length (ours measured 13cm). Place on the baking tray side by side with about 2cm between each bread sausage. Cover the baking tray or sit inside a large plastic bag. 7. Set aside to rise for the second time. Place the tray somewhere warm to allow the fingers to increase in size again, this will take about 40 – 45 minutes. After half an hour pre-heat the oven. 9. Bake. Place the baking tray in the oven and bake for about 13 – 14 minutes, turning the tray around after about 10 minutes. Once baked, and the underside is a nice golden colour use a pastry brush to paint the top of the fingers lightly with a sugar solution (4 dessert spoons of sugar dissolved into 2 dessert spoons of boiling water). Place the fingers straight back onto the oven rack (no baking tray) for a further 1 – 2 minutes. Remove from the oven and place on a cooling rack. 10. Glaze. Once the fingers have completely cooled decorate with a water icing made with icing sugar and a little water. Ensure the mixture is fairly thick so as not to run off the finger. Time: hands on time about 35 minutes; proving time; 12 – 13 minutes bake time; plus cooling time. 1. Make the dough. Place the flour into a good sized bowl. Add the salt to one side and the yeast to the other side. Add the sugar and butter. Rub the butter into the flour mixture a little. Make a well in the centre and add the egg. Pour in all of the milk and 3/4 of the water. Using your hand, mix the flour with the liquid, adding more water to bring the dough together and cleaning the bowl as you do so. You should need all of the water. Place the dough onto a lightly floured clean work surface and knead for 10 – 12 minutes. The dough is quite a soft structure but will become less sticky and more elastic and stretchy as it is kneaded. Perform the ‘window pane’ test to ensure the dough has been kneaded sufficiently. 2. Set aside to rise. Place the dough back in the bowl. Cover the bowl with cling film or a shower cap used purposefully for baking and set aside until it has doubled in size. This will depend on the temperature of the room. You can also prove the dough in the fridge for a few hours (or over night), which is what we did. Try not to rush this process, as the slower rise will develop more flavour. (NB remember to allow the dough to come back to room temperature before shaping the dough if it has been proved in the fridge). 3. Prepare a baking tray. Base line the baking tray with greaseproof paper. 4. Shape the dough. Tip the dough onto a lightly floured work surface and knock back. Divide into 6 equal pieces, ours weighed about 85g. Shape each piece into a ball and then roll into a sausage, all being the approximate same length (ours measured 14cm). Place on the baking tray side by side with about 2cm between each bread sausage. Cover the baking tray or sit inside a large plastic bag. 5. Set aside to rise for the second time. Place the tray somewhere warm to allow the fingers to increase in size again, this will take about 40 – 45 minutes. 6. Make the blackberry jam. Place the berries, sugar and water into a small heavy based pan. Place over a low to medium heat and allow to cook. Add the lemon juice once the mixture has heated through. Stir regularly with a wooden spoon. To test the jam, remove the pan from the heat and place a teaspoonful of the mixture on a tea plate. Put the plate in the fridge for a few minutes to chill. Once chilled, run your finger along the plate to touch the edge of the chilled jam. If the jam crinkles when touched it is ready. If not ready, replace the pan on the heat and cook for a few minutes longer and retest. Once ready pour into a bowl and set aside to cool. 7. Meanwhile make the ganache. Place the chocolate into a good sized bowl and break it up into small pieces. Pour the double cream into a small heavy based pan and heat gently until it is hot but not boiling. Pour over the chocolate and leave for a couple of minutes. Stir the mixture thoroughly and set aside to cool. Once fully cold use a balloon whisk or hand held electric beaters to whip the ganache until it is thick and creamy. Avoid over beating. Set aside. 9. Bake. Place the baking tray containing the dough fingers in the oven and bake for about 12 – 13 minutes, turning the tray around after about 10 minutes. Once baked, and the underside is a nice golden colour remove from the oven and set aside on a cooling rack. 10. Make the icing. Once the bread fingers have cooled completely make the icing. Place the icing sugar in a cup and mix with a little water, adding a tiny bit at a time. Add the cold blackberry jam and mix again. Add a little more icing sugar if necessary. You’re aiming for a very thick mixture which won’t run when applied to the fingers. 11. Assemble. Cut the bread fingers on the diagonal with a bread knife. Fill a piping bag (fitted with a fancy nozzle if you like) with the ganache mixture and pipe into the fingers. Using a pallet knife (or similar) spread the blackberry icing to the top surface of the finger, spreading it out carefully. Place half of the jam mixture into the second disposable piping bag, cut a small opening for the jam to come through. Pipe a line of the jam across the ganache filling. 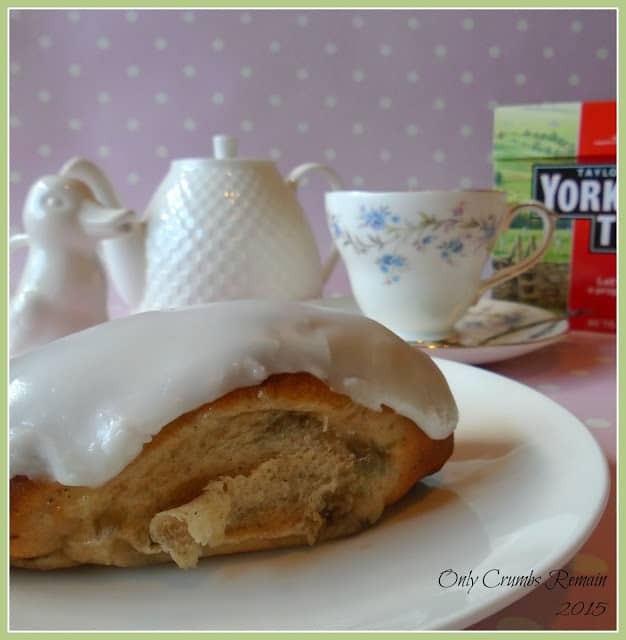 Another fabulous bake Angela The texture on your iced buns look perfect. I do particularly like the blackberry ones although both look amazing. Those blackberry ones were absolutely delicious, the foraged fruits brought a lovely flavour to the creamy filling and the colour was just so pretty. Hahaha, barm brack is just amazingly scrummy isn't it. It's certainly one of our favourite enriched breads. Yes, those blackberries were fabulous in the iced fingers. They were amazing sat against the sweetness of the white chocolate ganache. Ooh do give iced fingers a go Katie. They're delicious and not that difficult really! Do send me a picture when you have chance to make some. wow Angela these look gorgeous. the colour of those blackberry ones are so striking and teamed with white chocolate well just yummy! 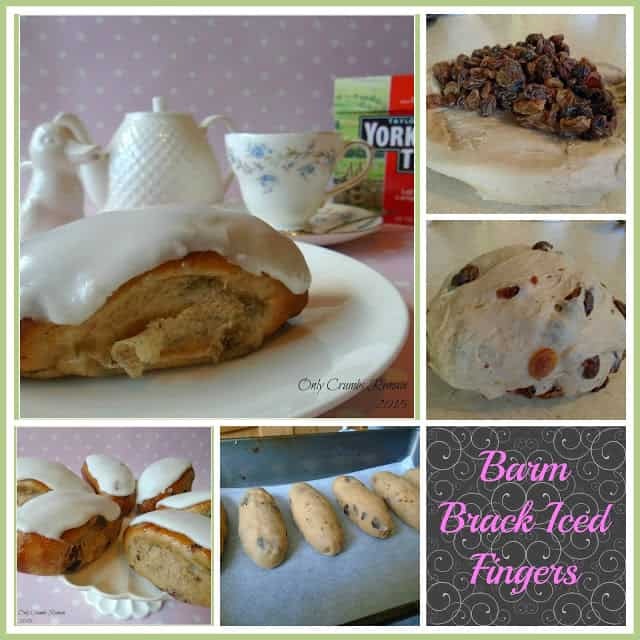 I have not heard of barm brack before but they sound a bit like a tea loaf bead which I adore so yeah I would happily eat all your buns!! Thank you Jenny. I'm finding blackberries great (slight understatement) for adding colour and flavour to bakes – plus they're free if you forage for them. 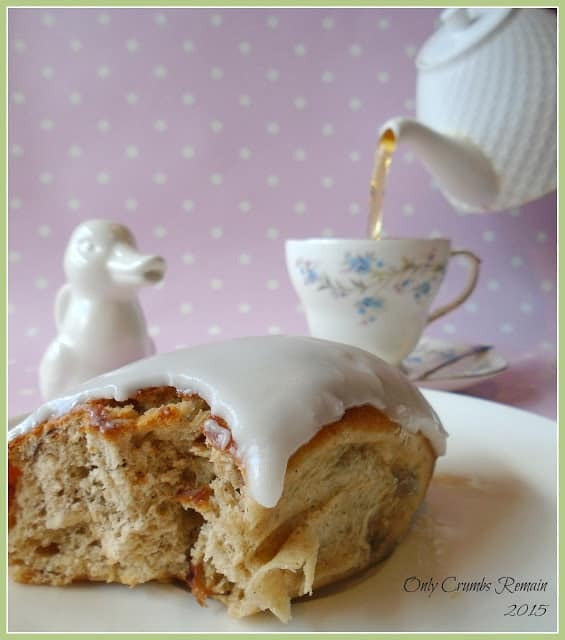 If you're anything like me and have the GBBO books, check out the first one for the Barm Brack. Yeah, it is a bit like a tea loaf. They baked it in a round cake tin and iced the top. Apparently they can have bits and pieces added to the mixture like a thimble etc (in much the same way we used to do with Christmas Puddings). Thank you Mandy. I came across the Barm Brack a few years ago in one of the GBBO books and have made it many time before it's so scrummy! Aw thank you Alice 🙂 You should try Barm Brack when you get chance, we think it's delicious! Plus it's really straight forward to make which is always bonus! haha, go on, just think of the smell as the dough bakes! Divine! It's amazing the strength of colour coming from the blackberries in the icing. It had a really good blackberryness flavour too even though there was only 1 or 2 teaspoons of the blackberry jam in the icing. they both look gorgeous,and I would have trouble choosing between which to have first too – I think I would need to try both! Thank you Helen 🙂 I must admit I was a little greedy and tried one followed by the second in quick succession! Aw thank you 🙂 Ooh you must try when you get chance, if for no other reason than the wonderful fresh bread smell which fills the house as the bread proves and bakes! It's so delicious! Hahaha, I think I must have gone a little over board picking the blackberries the other week – I've made sooo many recipes with them! Though I must say they were all delicious! Thank you so much Rebecca for your kind comments. I've really enjoyed seeing the bakes you've made from the GBBO inspiration too – especially loving your mini three tiered bake this week. It's delicious Anca , its not an 'in your face' level of spicing but just enough to give an extra flavour. I hope you do give Barm Brack a go, either as a large 'cake' style loaf or as individual bakes. Do let me know how you get on. Thank you Jasmin 🙂 I love GBBO but this is the first year that I've actually baked along with the challenges. You'll definitely have to give them a go next year, it's really good fun! It's really interesting seeing other people's bakes, they're all so different yet stem from the same challenge.